“You never get a second chance at a first impression.” Though you’ve likely heard the importance of first impressions regarding dating or interviews, the same is true for your SaaS website. Being an online-only company, and a potential technology partner for your target audience, your website speaks volumes to new visitors. What is it saying right now? Creating or redesigning a SaaS website can be intimidating, but as always, start with the essentials. SaaS websites can be as simple as a single landing page. They can be as complex as an extensive web of pages and resources. No matter the size, there are a few crucial elements that every SaaS website needs to drive conversions. One study found that once a site loads, people form opinions about a company based on what they see in just half a second. This ridiculously fast impression time means you need to establish your relevancy right away. One way to do this is by including an eye-catching and benefit-driven value proposition at the very top of your page, or “above the fold.” This short phrase needs to be impactful and relevant to keep users intrigued. When it comes to how you show off your value prop, there are different ways to go about it. For example, Evernote uses a clean animation with rotating text to make visitors take notice of the benefits of their service. Another perfect example of including a value prop above the fold on a SaaS website is Salesforce. 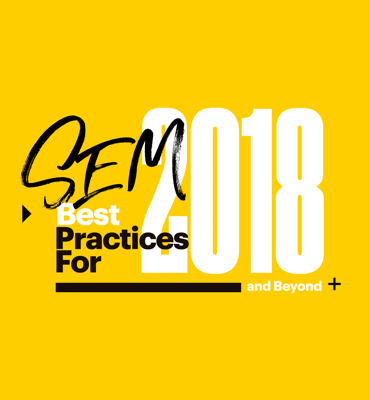 Their value prop above the fold is targeted to small businesses, highlights ease and usability, entices readers with a bonus offer, and inspires action with 2 CTA buttons. 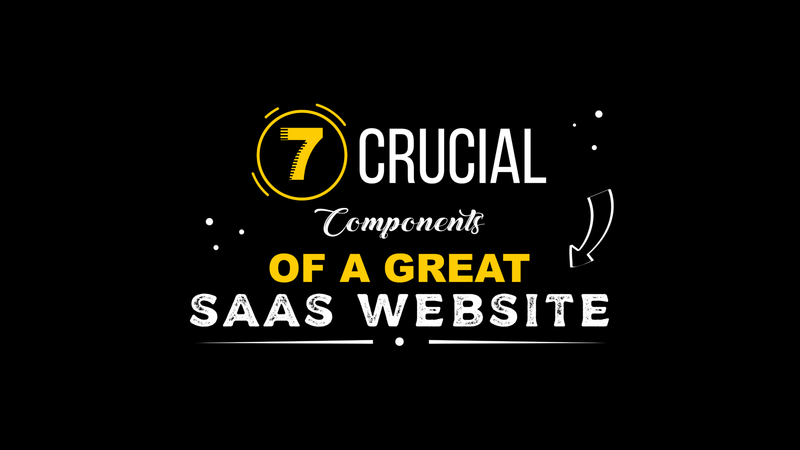 Including a section talking about the importance of including information on your SaaS website on a list of crucial website components may seem obvious, but this point is multifaceted. While “show” does mean that you should include photos and demos of the platform, it also consists of the need for clear descriptions. For example, your site needs to have product pages that highlight features, pages to demonstrate different use cases, and sections that speak directly to different target audiences. 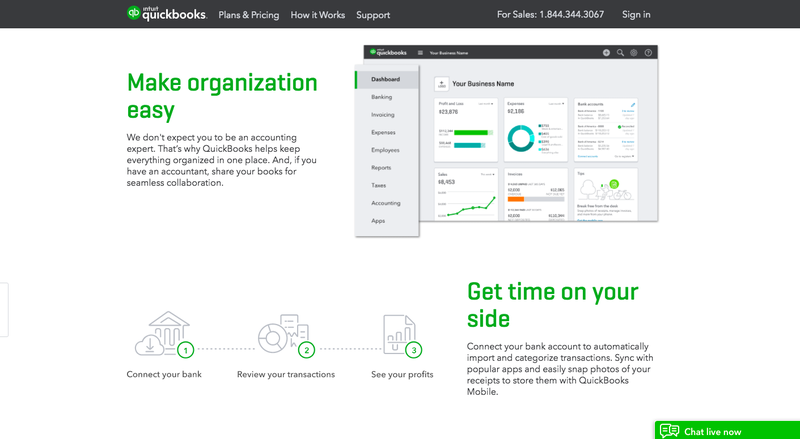 QuickBooks demonstrates this principle on their homepage where they start to highlight features and show the SaaS in action. The descriptions include a mix of benefits and product features, and let potential users get a glimpse of what they can expect with the dashboard. Another powerful feature that deserves a spot on your SaaS website is a spot for testimonials or some other form of social proof. 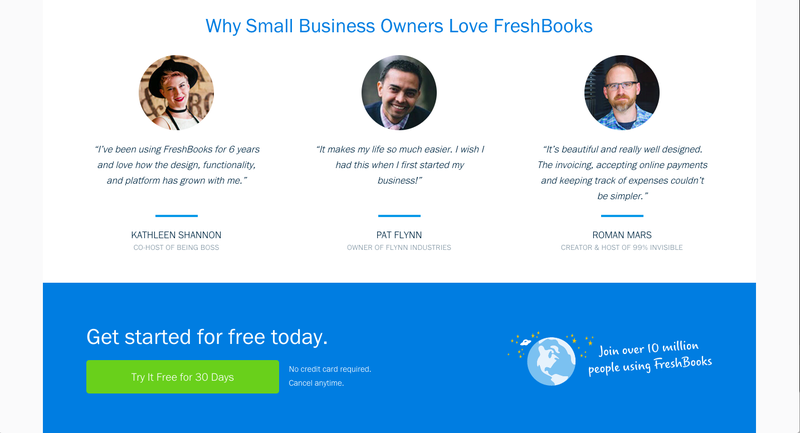 The concepts that FreshBooks uses can even be implemented on websites for small SaaS companies. Sharing real user quotes and stories establishes social proof, even if you don’t have an astoundingly large audience or quotes from well-known customers. As a SaaS, you’re selling a recurring relationship. Therefore it’s essential that potential users know how much they’re signing up for every month. Transparent pricing is a critical component of your SaaS website, but you can make it a compelling conversion tool too. 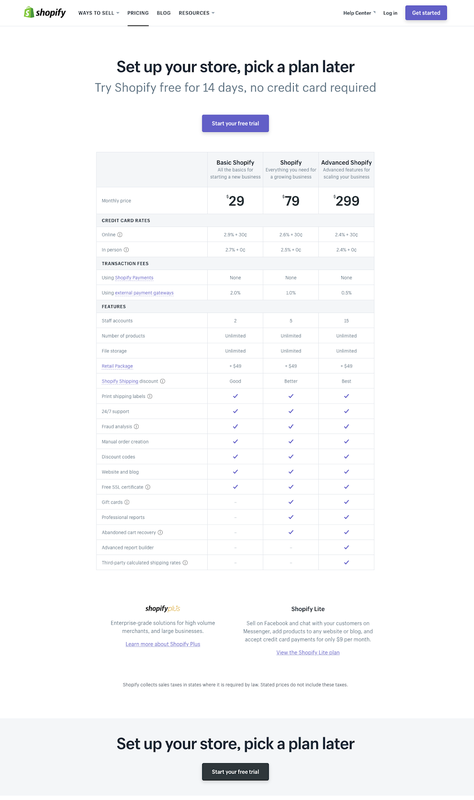 For example, Shopify compares their plans in a standard way, but then they add even more value to the page. Right after a potential customer scrolls through allllll of the different features and which plans have which benefit and the person is overwhelmed, Shopify offers a way out. That is, they take the burden of choosing off their shoulder and essentially say “you know what, we understand it’s hard to choose. So why choose right now? You can start using right now with a free trial. You can also procrastinate choosing until later.” In this way, the pricing page acted as a driver towards free trial sign-ups. Exactly how you offer a free sample to potential users is up to you, but it needs to be on your site somewhere. Investing in a SaaS isn’t the same as buying a static, inanimate object. A SaaS is a service that has different moving parts, will be used regularly, and has to be accepted and adopted by likely an entire team eventually. A free trial, or a demo at the very least, gives users a chance to try it on for size. It’s also an industry standard, and your target audience will be expecting it. You can also take a cue from Shopify and present the free trial in unique ways across the site. You can also find SaaS website inspiration from GoToMeeting. At the bottom of their homepage, they have a large and eye-catching section that makes signing up for a trial as easy as entering a single email. The Shopify approach of making a free trial seem like a relief from choice and the GoToMeeting strategy of removing nearly all sign-up friction prove there are multiple ways to achieve the same result. A pretty website full of great information is pointless if you don’t channel visitor attention into action. Including clear CTA buttons is your way to capture leads, get potential customers into your sales funnel, and establish a relationship. Unbounce took a slightly different route with “Preview the landing page builder” instead of “see a demo” and “see how Unbounce can help me” to lead to a product page. Once again, successful examples prove that there are different ways to achieve the same result. 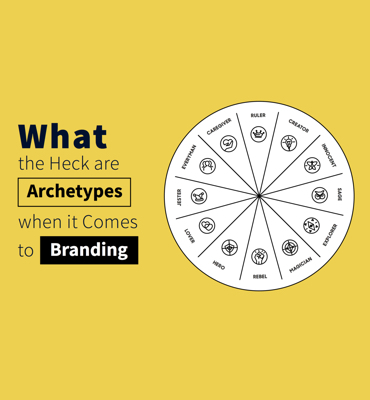 The exact copy you choose will depend on your brand and tone. 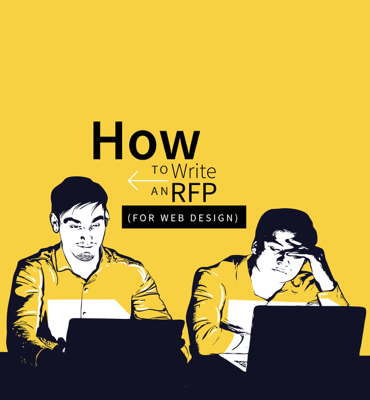 Additionally, your website copy should make sense with your CTAs. Your CTAs need to align with your goals and lead conversion strategy. Content marketing should be a cornerstone of your SaaS inbound marketing strategy. It deserves a prominent place on your website. 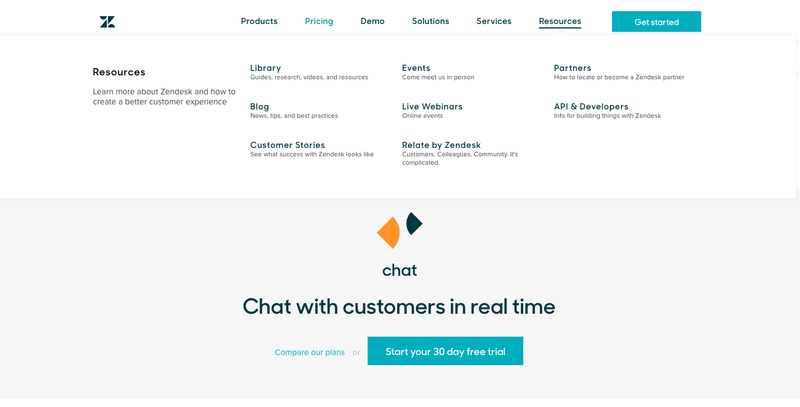 Zendesk understands the type of content that SaaS customers want to see, so they have a variety of ways potential customers can explore the brand. Under “resources” they have blog posts, webinars, case studies, events, research, videos, and more. Additionally, your website design matters as much as your content and copy. We established that first impressions happen fast, and that’s due in part to the fact that people are visually driven. In fact, given 15 minutes to consume content, people prefer a beautiful design to something plain. Are you looking to drive more leads from your website? Get the guide below to start converting blog visitors.